Digital Cartridge for 35mm Film Cameras | Shelby White - The blog of artist, visual designer and entrepreneur Shelby White. 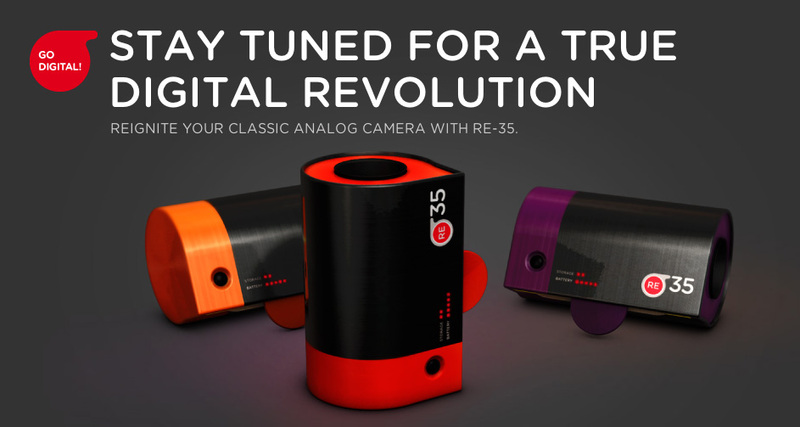 The RE-35 is a cartridge just like the classic 35mm film roll that slides into the standard film camera compartment. 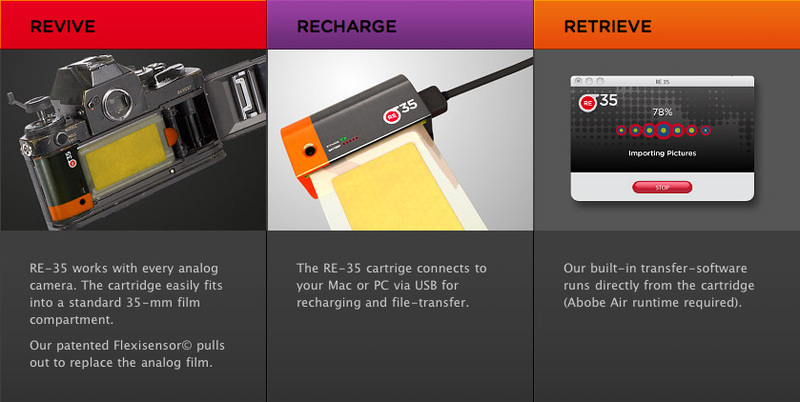 The RE-35 cartridge uses flash memory to save the digital images in high resolution JPEG’s or RAW up to 4, 8 and 12 Megapixels. To export the photos and charge the cartridge you connect the cartridge via USB to your computer. It works on both Mac and PC. Unfortunately there aren’t any test shots or tech specs on this just yet. I sure hope this is as good as it looks and not an April fools prank. It’s an awesome idea and I’d hope the quality would be representative of actual film. Curious about the cost for this thing because I’m completely sold. What do you think about the cartridge? Hey Julien, can you confirm that this is an April Fool’s joke? Even if it were true – I would not use it. It does not solve the problem of digital imaging: Grain vs. noise. i fell for this too…. i dont think it was a “prank” tho. just a design project. It’s a real shame this is a fake and that someone fooled us photographers! Agreed with Tom; I have a DSLR and a film SLR and I’d like to keep them that way. Seemed like a cool idea at first, but then I thought about it some more and I’d never want that option. My analog camera is for film and the digital is for everything else. I’ll keep it that way. Not like they could do it anyway…bastards. 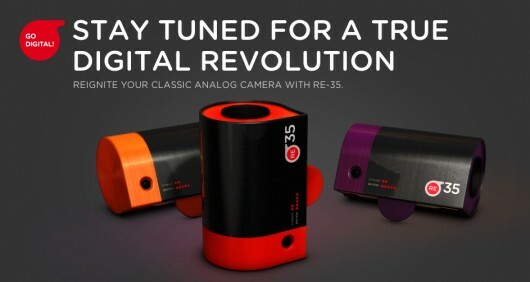 I dont really think an april fools joke or a fake but an industrial designers concept, in which I think it is an interesting idea, maybe in the end, it wouldnt truly be shaped like a roll of film, as we would need flexible sensors, but I like the idea of dropping a sensor into a old film camera, could be a lot of fun. to me it seems like its disprespectfull to the designer to call it a joke or a fake. its a concept. We got caught ourselves. :( Can’t say we weren’t suspicious of it though. I freaked out when I first saw this. I found out it was an April Fools joke a few days later. I was so upset with myself. Good idea . If anyone knows about this kind of kit, now ir in feuture, please let us know. It is realy usfull for older good cameras that we are still keeping. Still waiting. I want it!